Oil production at Tengiz field will be increased by 12 million tons (260,000 barrels per day). The Kazakh-American Future Growth project with an estimated cost of more than 3 trillion tenge was launched at Tengiz field, Kazakh media outlets reported. This project will allow increasing volumes of extraction of raw materials on Tengiz field by 12 million tons per year that is from 27 to 39 million tons. The new plant will consist of individual modules weighing 53,000 tons. It is expected that the works will be completed by 2022. “Over 500 contracts with Kazakh companies were concluded and 1,900 companies will be involved in the manufacture of modules and other equipment. 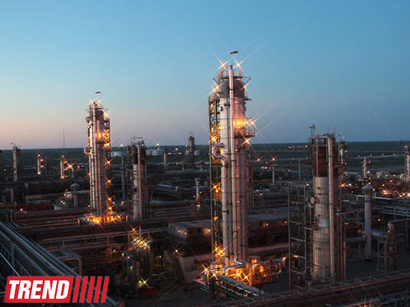 Not only in Atyrau, but also in Aktau, Almaty, Aktobe and other cities of the country,” Chevron's Deputy General Manager Haymish Paulse said. Chevron Corporation became the first foreign company which signed agreement with Kazakh President Nursultan Nazarbayev in 1993. For 25 years, production at Tengiz has grown from 4 up to 27 million tons per year. Chevron is a shareholder of the projects for developing the largest oil fields - Tengiz and Karachaganak - in Kazakhstan. It has a share in the Caspian Pipeline Consortium and owns a plant for manufacturing polyethylene pipes in Kazakhstan's Atyrau city. Transit routes for the expected large volumes of oil - Tengiz and Kashagan have already been prepared. The expansion of the CPC pipeline, which connected Tengiz with the sea port of Novorossiysk, was completed. This was also done with the involvement of investments of American companies. Currently, more than 500 American companies operate in Kazakhstan. The implementation of the project to expand Tengiz started against the backdrop of the OPEC+ contract on limiting oil production. At the beginning of the year, Kazakhstan was accused of exceeding its production volumes. Tengiz is one of the biggest oil field in Kazakhstan. Its oil reserves are estimated at 3.2 billion metric tons (25.5 billion barrels). Tengizchevroil reached the record level of oil production of 27.16 million tons in 2015. In 1H 2016 oil production hit 14.4 million metric tons. The shareholders of Tengizchevroil are KazMunaiGas national oil and gas company of Kazakhstan (20 percent), Chevron Overseas (50 percent), ExxonMobil (25 percent) and LukArco (5 percent).